Reader Mark Sturtevant sent some nice arthropod photos taken this summer. His comments are indented. 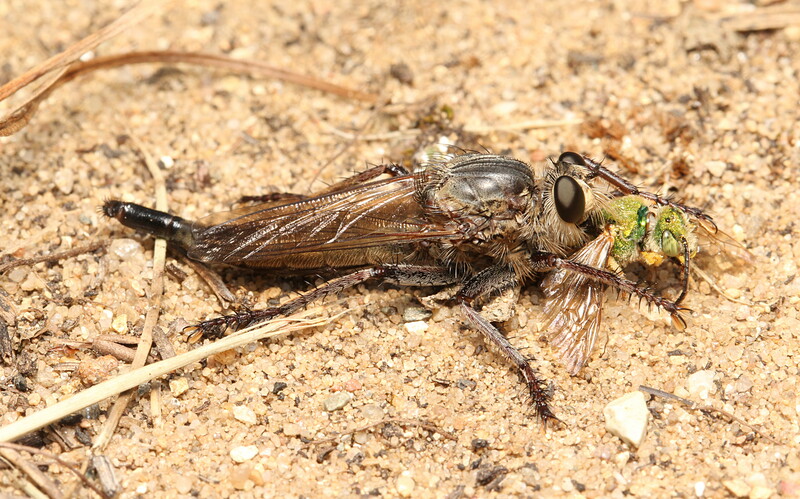 The first two pictures show very large robber flies that were within feet of each other, and they appear to be the same species. I suspect they are Proctacanthus . The first is a male, and the second, a female, is eating a green Halictid bee. 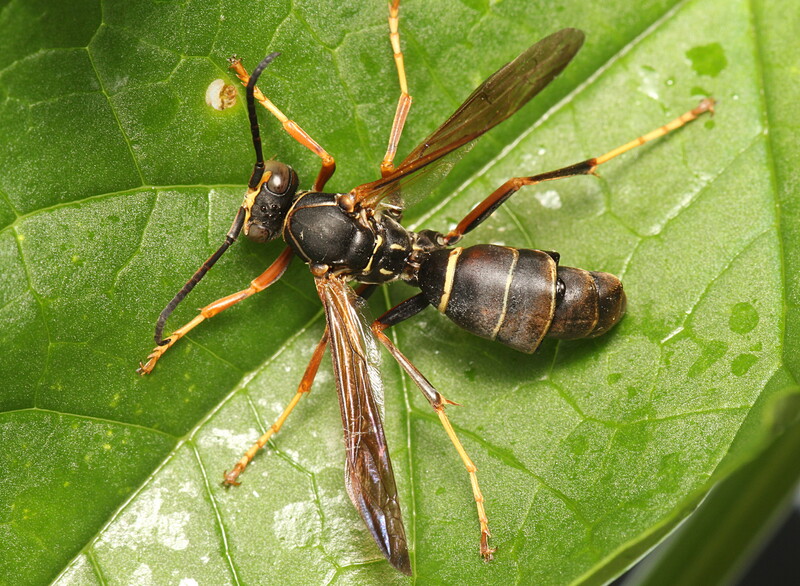 Next is a large wasp-mimicking fly known as a thick-headed fly (Physcocephala furcillata). Thick-headed flies grow as internal parasites in various insects, and this kind is thought to parasitize large bees. I occasionally come across a dead/dying bumble bee or carpenter bee, and it is possible that these had one of these flies. Purple aster flowers are always popular with pollinators, so I have been cultivating a large number of them in my back yard. 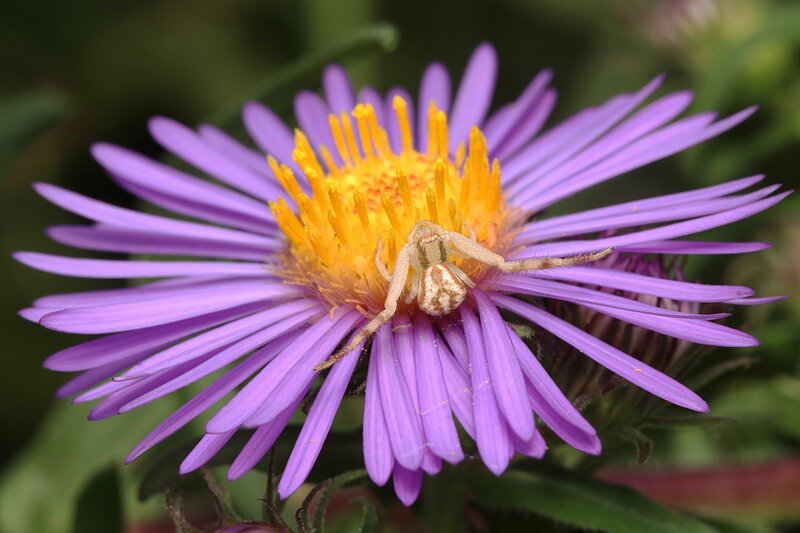 The next picture shows a crab spider (I think Mecaphesa sp.) lurking among the flowers. The next picture was taken the day after when the spider had caught a small ichneumon wasp. Green darners (Anax junius) are among our larger and most alert dragonflies. Mature ones will fly pretty much all day, but young ones can not fly far. The next picture shows that it is possible to get very close to these insects at this time. 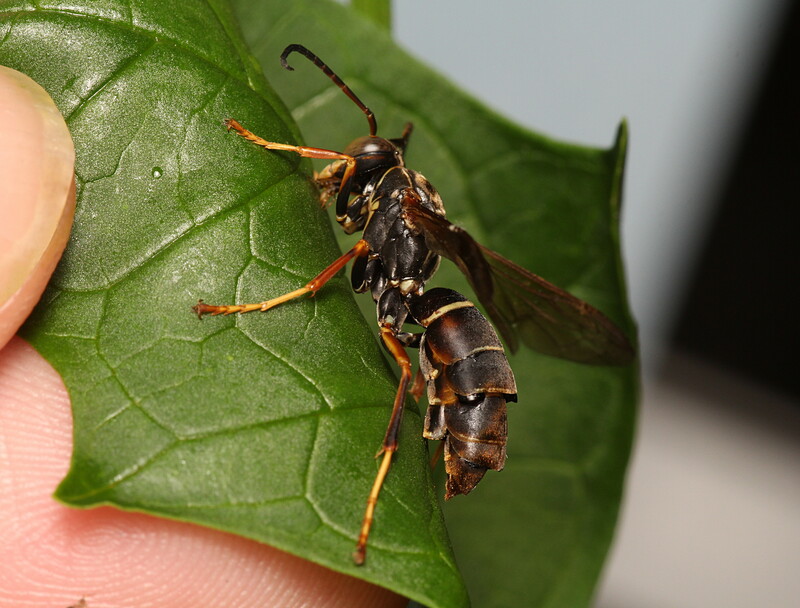 Finally, the last pictures are of a paper wasp (Polistes fuscatus) that has been parasitized by several ‘twisted-winged parasites’, which are really weird insects belonging to the order Strepsiptera. These insects that have been hard to classify. They were once considered related to beetles, and more recently they were considered closer to the flies. But it looks like their affinity to other insect orders has again been thrown into disarray. In any case these insects parasitize a range of hosts, but the ones I know best go after Hymenopterans. Male Strepsipterans emerge from their host with a weird set of wings (see here), and they fly to find a female. Females lack limbs, and they only partially emerge from their host to produce a pheromone that attracts males. This wasp was hosting several females, and at this point it was pretty weak and unable to fly. After mating, fertilized Strepsipteran eggs hatch inside the mother and the larvae burst out of her. These mobile larvae must then hunt for another host to repeat the life cycle. This entry was written by whyevolutionistrue and posted on September 28, 2018 at 7:30 am and filed under insects, photography, spiders. Bookmark the permalink. Follow any comments here with the RSS feed for this post. Both comments and trackbacks are currently closed. Since there are asters, this must be a temperate zone, and given the Strepsipteran life cycle, how do they overwinter? And somewhere in that there’s a pro-choice comment, too. 1. 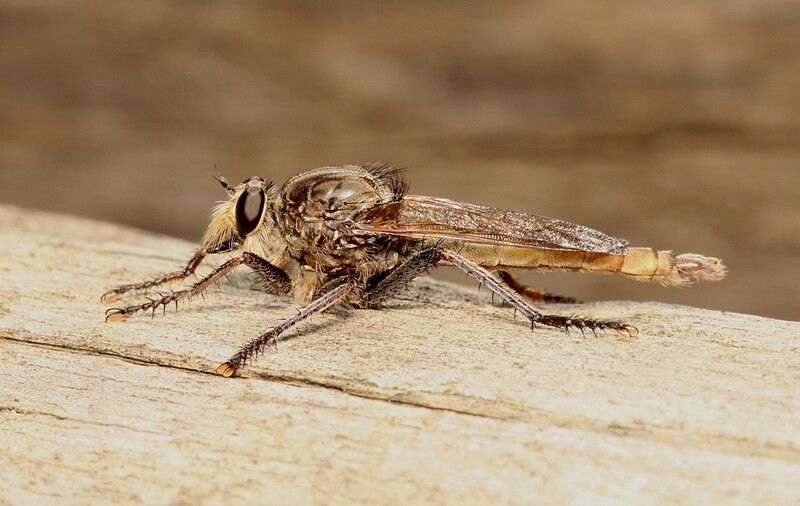 I was reading about robber flies and compost piles, but specifically robber fly larvae. Long story short : it’s all good. 2. Dead or dying bumblebees – I was wo wondering what the story is, because I regularly see them around the area. I’ll have to look for holes now. Beautiful pics, like usual for RWP! I can’t always comment though! A suggestion if one is found moribund but still alive is to just keep it in a container with air holes. If it has a developing fly it might emerge. Yes, I think that qualifies as goulish enough to be entered into a “Mad Scientist Experiments for the Morbidly Curious” anthology. In that case I’ll report back! Beautiful photographs. These arthropods, a killer universe all by itself! Mark, are you going to raise the parasites out of that wasp? The way to see a male would be to catch host wasps and raise put the parasites, right? I know little of these insects, but it seems to me that a parasitized host might not seem that abnormal until the ‘sites erupt and leave. So I don’t know which wasp to hang on to. I was contemplating keeping a wasp like the above in a cage with largeish mesh, and checking on it from time to time to look for males attracted to the females. 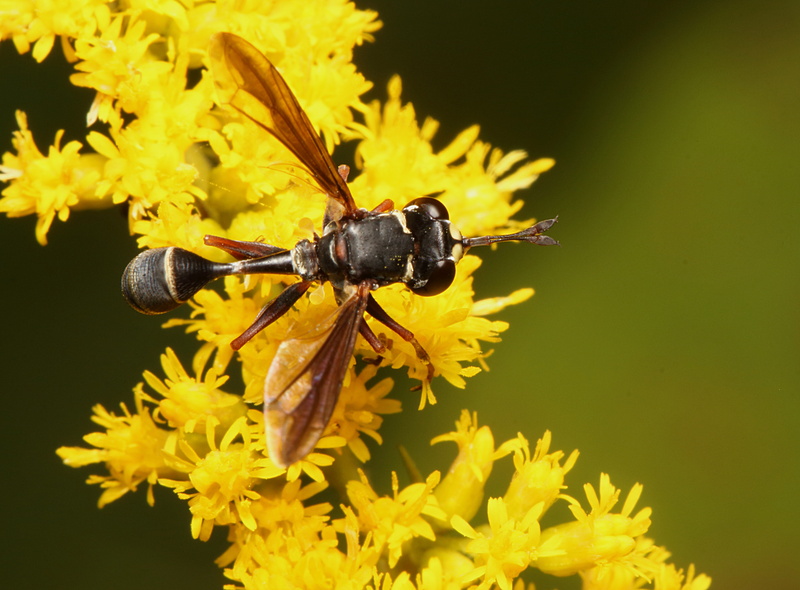 Last summer I saw 3 different parasitized wasps, including this one. This summer, it was zilch. I love robber flies! I’ve only seen one in person once and I found it so fascinating with it’s little moustache. First rate. Dragonflies are my favorite arthropod. 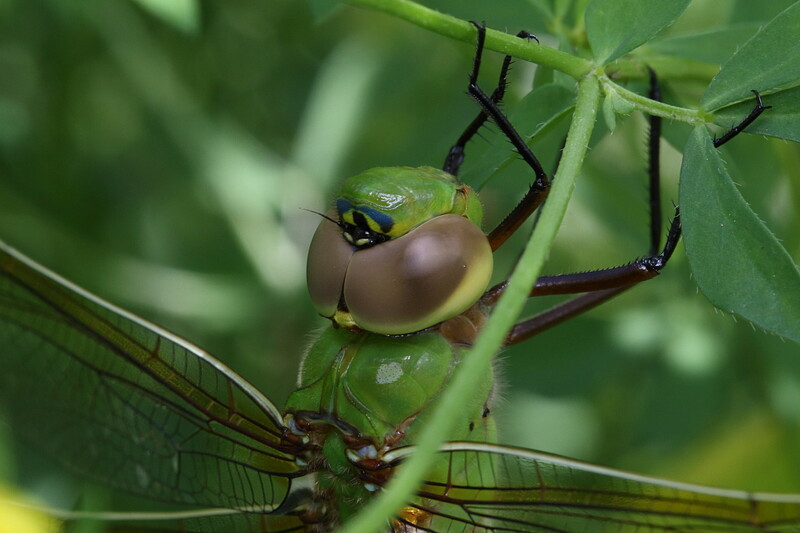 That green darner is a beauty. Scary pictures prompting scary thoughts. Makes me glad to have been born a reasonably large, safe mammal. Your photos amaze me. Always appreciate well developed comments. Thank you for sharing. Another example of why I read Jerry’s WEIT posts every morning while I have my coffee. Yes, great photos and interesting commentary as always. Why does my border collie want to “play with” poisonous creatures? I have a German Shorthair Pointer that attacks hornets and bees. She’s been stung a number of times and just sneezes and slobbers for a while and goes back at it. I don’t get it either. Bees are just spicy sky raisins (stolen from a FB post). And congrats to Mark Sturtevant on another batch of great pictures. Great shots Mark. I first heard about Strepsipterans here on WEIT from a Matthew Cobb post. I have to say they freak me out a bit, and I feel sorry for their hosts. Strange feeling sorry for an insect.